Volunteers of the spectacular open-air live action show, ‘Kynren – An Epic Tale of England’, in Bishop Auckland were delighted recipients of The Chairman’s Medal today at Durham Town Hall. 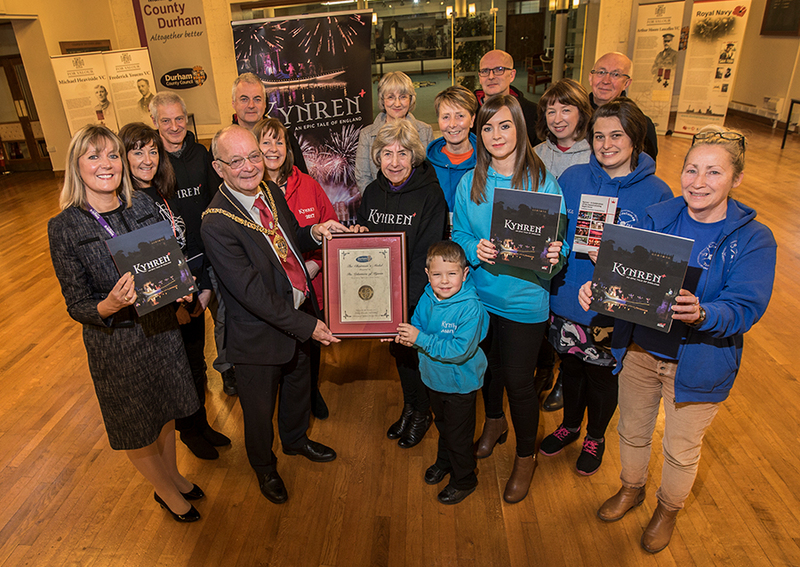 The Medal was presented by the Chairman of Durham County Council, Bill Kellett to 14 Kynren volunteers representing their 1,500 peers, in recognition of their outstanding Volunteering. The Chairman’s Medal is the highest civic honour that Durham County Council can bestow. A prestigious honour, only presented to a small handful of individuals, groups and organisations throughout County Durham every year, in recognition of significant achievement and outstanding effort in all walks of life. Bill Kellett, the current Chairman says “It is particularly important to recognise those groups that give up significant time to volunteering and Kynren Volunteers were top of my thoughts for this award. Also attending the ceremony was Steffa McManners, Trustee of Eleven Arches: “We are delighted to receive formal recognition of the our Volunteering programme known as “The Archers”. “Kynren” means ‘generation’ and each year our family of Archers grows with more people of all ages and from all walks of life. Entire families have been enthused by the unique experience of a shared activity; it’s also an opportunity to gain confidence, learn new skills, be trained by leading industry figures and reconnect with the local community while making real bonds and new friends, who they socialise with, not just for the Kynren programme, but all year wound. So, my message to anyone thinking of volunteering is: just do it! Come and meet us at one our Open Evenings! “ Anyone who is interested in joining the 2018 Kynren production is urged to attend one of the last two Open Evenings prior to the 2018 start of the training and rehearsals months. * Wednesday 6th December 6.30pm * Wednesday 17th January 6.30pm Eleven Arches is particularly interested in recruiting new members, for its highly-praised experience team - the warm and friendly faces who made history when they welcomed more than 100,000 visitors in 2016. Notably, males who have an equestrian interest and can confidently ride a horse, men in general for roles across all teams –actors on stage, operations, technical for ex-, families with young children and teens, and young women who would like to dance are all highly sought after. The sessions are an opportunity to meet existing volunteers, get to know the team behind Kynren and discuss the range of volunteer roles available. Each fun, informal session lasts 1.5 hours and is held on the Eleven Arches site at Flatts Farm, Bishop Auckland. No experience required, no registration required, just turn up 10 minutes early in suitable outdoor clothes and footwear.